​Prairie Valley School Division #208 celebrates diversity and inclusion. Our Vision is Leadership in Learning and Life and our Mission is to Inspire and Empower One Another. The Bright Futures Award is in memory of Raymond Frederick Jordan, who lived in the Whitewood area and left a generous bequest to establish a bursary for the benefit of students in Prairie Valley School Division. It was created to acknowledge those graduating students who have demonstrated outstanding leadership in inclusion and diversity to promote growth in their school and community. Up to three awards of $1500.00 will be awarded each year to the successful applicants. During the time of the Treaty negotiations in Saskatchewan, the Elders spoke of a concept called "pimâcihowin" (pronounced pee-mah-che-ho-when). In English, this Cree concept means "the ability to make a living." This is a holistic concept that includes spiritual, mental, physical and emotional aspects. The Farley Family, who have farmed near Grand Coulee, Sask. for 80 years, has established a $1500 scholarship for a Prairie Valley School Division graduate, in honour of the Treaty relationship. This scholarship will be presented to a self-declared First Nations/Metis student enrolled in Grade 12 in PVSD, who displays perseverance and diligence as a student. The student must be caring, generous, responsible, and involved in their community. The recipient must be enrolled in a post-secondary program (SIAST, U of R, U of S, Police program). ​For many decades the Linn, Bode, and Watson families have been deeply involved in southern Saskatchewan agriculture. Through their partnership with John Deere and the support of their staff, each of these three families grew successful local businesses dedicated to serving and promoting Saskatchewan's agriculture industry, evolving into the South Country Equipment structure of today. In 2013, they established the South Country Equipment Agriculture Scholarship as a further way to recognize the support they have received over the years, as well as support young people pursuing careers in Saskatchewan's agriculture sector. This $500 scholarship is awarded based on academic achievement and community involvement to a graduate of Greenall High School, Montmartre High School and Robert Southey School. 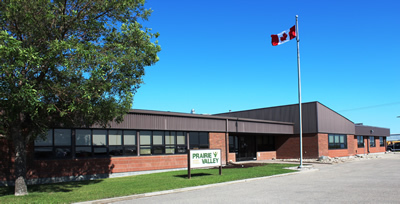 If suitable candidates cannot be filled by these schools, then it will be open to all of Prairie Valley School Division.